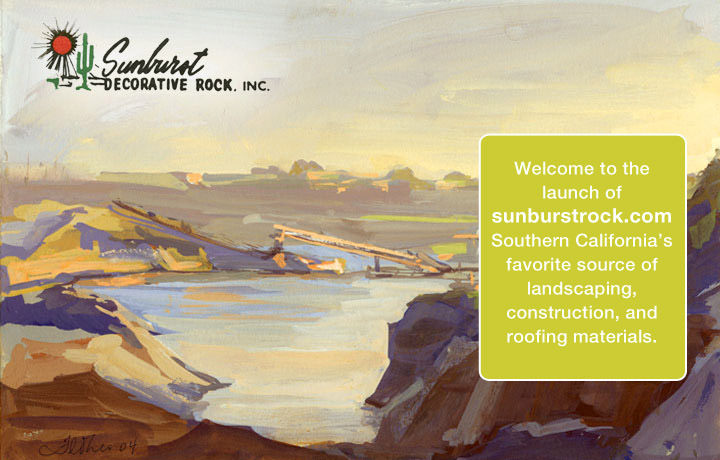 Sunburst Decorative Rock is one of the largest wholesale and retailers of materials for landscaping Southern California. We also carry materials for construction and roofing. We are rock experts, so expect us to know everything about common granites, gravel, pebbles, boulders, and flagstone. We carry rock imported from the depths of Malasia to decorative granites excavated from our own quarry–a wide selection from around the world. Sunburst supplies materials for construction and landscaping such as sand and roadbase, and we offer special services for boulder placements and material delivery. Experts at Sunburst provide landscaping and stone-scaping services as well as custom design and project consultations. Above: Sunburst quarry at sunset.